Last week saw the realisation of Spiritato’s innovative ‘Guts and Glory’ project. 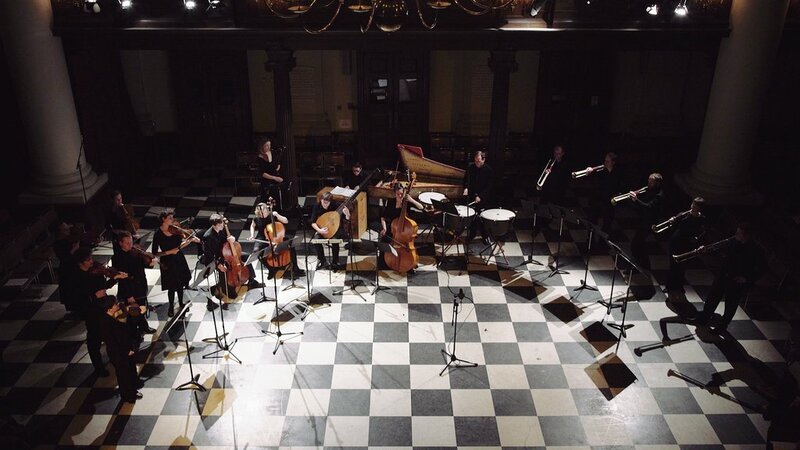 Exploring ‘equal tension’ strings and using natural trumpets without finger holes, the group devised and delivered a programme of 17th Century music by Biber, Schmelzer, Vejvanovsky and Bertali. The project began with an open rehearsal and discussion event on Friday 8th April 2016 in which Spiritato welcomed guidance and experience from the French natural trumpet player Jean François Madeuf. 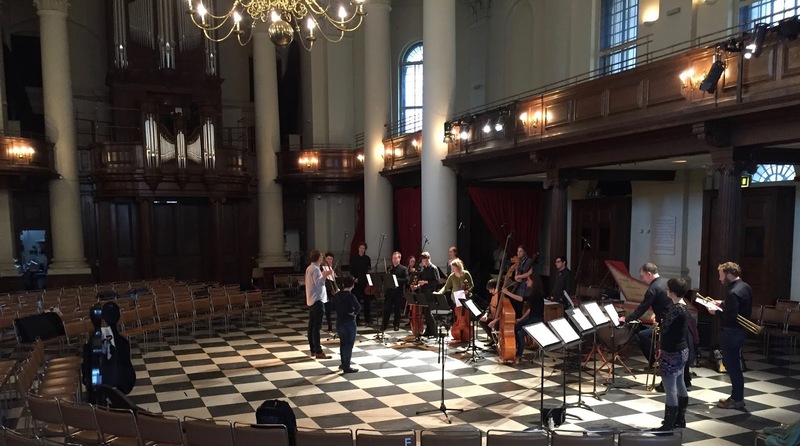 After a long weekend to individually mull things over, there followed four days of immersive rehearsals at Forest School in London before a concert was given on Friday 15th April 2016 at St. John’s Smith Square. The first rehearsal introduced the idea of using natural trumpets (without holes) within the orchestra. The open nature of the rehearsal utilised the experience and influence of those present. Jean François Madeuf directed the first rehearsal. He introduced and discussed ideas as they arose in the pieces that Spiritato had chosen to play. The open rehearsal had a small but influential audience and we are hugely thankful to those who attended for their contribution, support and interest. 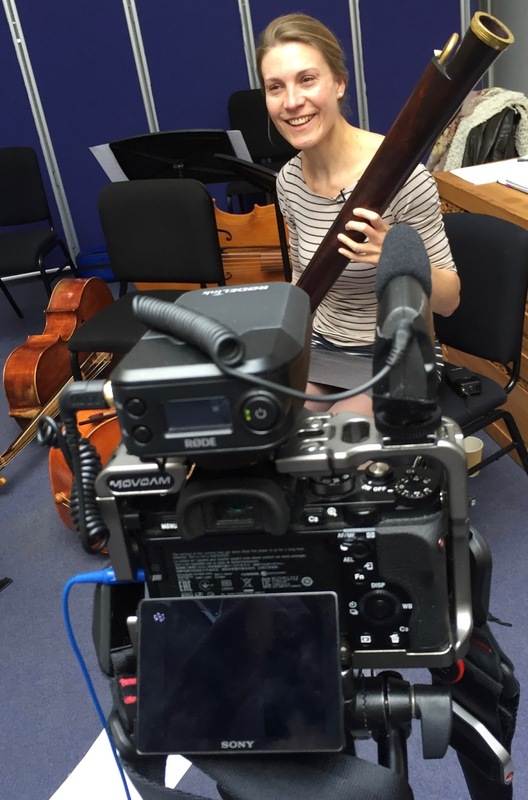 Apart from anything else, the presence of other musicians, audience members and a director ensured that the first rehearsal operated at a high level - though equally we felt that it was a safe enough environment to be able to make errors or mistakes in pursuit of learning and in the nature of experimentation. The discussion that followed the rehearsal was very well led by Richard Thomas. He asked excellent questions that invited players and audience members to collaborate and discuss ideas. He kept the discussion balanced, light-hearted and flowing. The debate covered very interesting ground and exciting conversations continued afterwards at a nearby pub, where the vast majority relocated after the rehearsal. After a weekend apart, the four subsequent days of rehearsal proved to be an interesting time as the group rehearsed and developed their own approach, using ideas from the open rehearsal and introducing others into the mix. The orchestra is a hand-picked group of young, open-minded, inquisitive, intelligent and experienced musicians. The group reconsidered several currently accepted conventions and worked to maintain a high professional standard, despite the challenges of newly introduced ideas. It was fantastic to witness and to contribute to these rehearsals as they unfolded. The process wasn't always easy or fast - but a generous amount of rehearsal time had been designed into the schedule to allow chance to consider these perhaps unfamiliar musical parameters. It was refreshing to have the time to immersively discover this interesting music and to have discussions and exchanges of ideas as a group. As time went on, the group reached a general consensus and balanced their approach, based on the ideas raised throughout the week. The group seemed to have adapted well to using ventless natural trumpets and 'equal tension' strings. Spiritato had developed its own tuning rituals to allow each of us to find the best resonance from the instruments. It took a few days to adjust to new equipment, new ideas and new sounds - but it was certainly proving to be worthwhile. The sounds coming from the string instruments were fantastic and the section sound was equally balanced, much like a consort. The uncovered, plain gut strings gave vibrant and characterful sounds, rich in overtones. I appreciated the visual and audible benefits of having incrementally sized string instruments throughout the entire section. 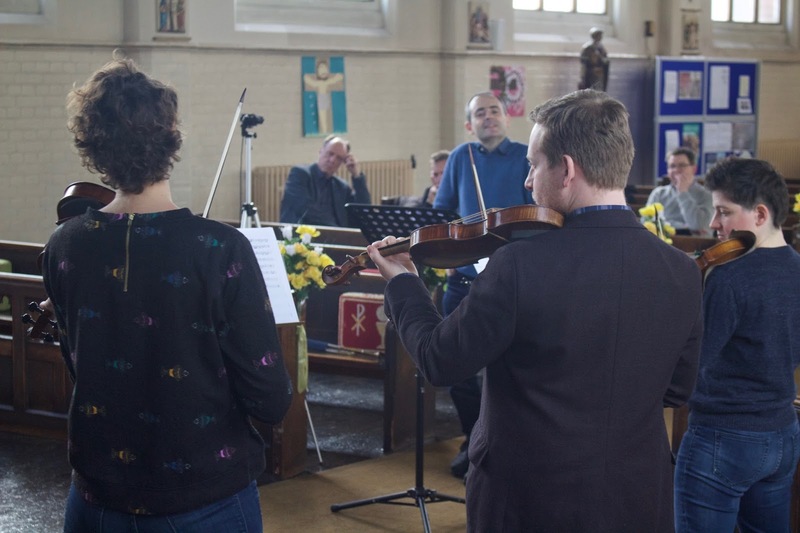 This was particularly apparent in the viola section, where there were often three different sizes of viola in use by Joanne Miller, Nichola Blakey and John Crockatt. The largest viola was aptly nicknamed 'Big Ted'. In one of the breaks, I was interviewed by Will Russell for Spiritato's 'Guts & Glory' video, being filmed by Zen Grisdale. I seem to remember answering one of the questions by saying something to the effect of: "as any good craftsman or woman will tell you, the tools teach you how to complete the work. Now that we are using uncompromised [or, at least, signifcantly less compromised] tools we are finding that this music has something different to say to us." Another quoteable phrase came in a reheasral from one of the string players: "As we have these trumpets, we may as well embrace them". I couldn't agree more. In this repertoire and in this progressive project, it was certainly worth learning from the tuning and sounds of the natural trumpets rather than trying to skew or distort them to fit with our own modern conceptions. It was so fantastic to work with other musicians who supported and appreciated this. There was a real sense that this project was paving a way for others to potentially follow - though the proof of this would be dependant on the quality of the performance. In the final stages of the rehearsals, we played large sections of the music - looking at the bigger picture rather than at smaller details. This was the best thing we could have done at this stage. It meant that we could rehearse the music as it would really happen in the concert, rather than under controlled or contrived conditions. The concert was a great success. It was well-attended and the audience reaction was overwhelmingy positive. I appreciate that the comments that I heard may have been biased, but the words that kept on cropping up were 'exciting' and 'convincing'. We could not have hoped for better! There were a huge number of memorable moments. Without giving away too much, the performance is dynamic and interesting and the programme integrates military music with art music. Virtuosic chamber works punctuate the larger pieces and the audience certainly gets a fair share of both 'Guts' and 'Glory'. I have intentionally refrained from divulging too many details of the performance as we have further performances of ‘Guts and Glory’ at St. George’s, Bristol (Wednesday 9th November 2016), Brighton Early Music Festival (Friday 11th November 2016) and York's National Centre for Early Music (Thursday 8th December 2016). Well done to everyone in Spiritato and particularly to Will Russell for dreaming up and pursuing this project. Thanks must also go to the supporters, sponsors and other helpers who have assisted us along the way. Spiritato! Guts & Glory Tour from Spiritato! on Vimeo.